Welcome to the May Healthy Dinner Blog! This month we’re featuring Baked (or grilled)* Salmon and Veggies. It’s plenty of protein with an Omega-3 bonus, in a super quick meal with easy cleanup. Salmon is one of the only meals that EVERYONE in my family eats without any complaint (as long as they don’t see any pepper on their piece, kids!) It’s a staple in our weekly meal rotation, and while I occasionally get complicated, this basic recipe is my go to. It’s easy enough for weeknights, but fancy enough for a special occasion. We made it for Mother’s Day this year! My secret for flaky, but juicy salmon is foil. We layer veggies and salmon fillets with infused olive oil, salt, pepper, and lemon in a foil pouch. The recipe is a take-off on the French method of cooking “en papillote,” where ingredients are carefully folded into a parchment paper pouch that resembles a butterfly. It comes out of the oven looking toasty and fancy, but it’s a pain to get that pouch folded tightly enough to steam the food. Foil works just as well and it’s so much easier! This is another great opportunity to get the whole family involved in cooking! I prep all the vegetables and then call each person in to choose their own. My son loves helping me build the vegetable foundation for the fish, and it makes it so easy to keep my daughter’s dinner safe from onion (or any other flavors, for that matter, we’re working on expanding their pallettes.) Plus, getting their own packets helps the kids get excited about dinner. Prep your veggies. Chop the zucchini into 1cm thick rounds and thinly slice the onion. Slice the lemon into thin rounds, as well. Start building! 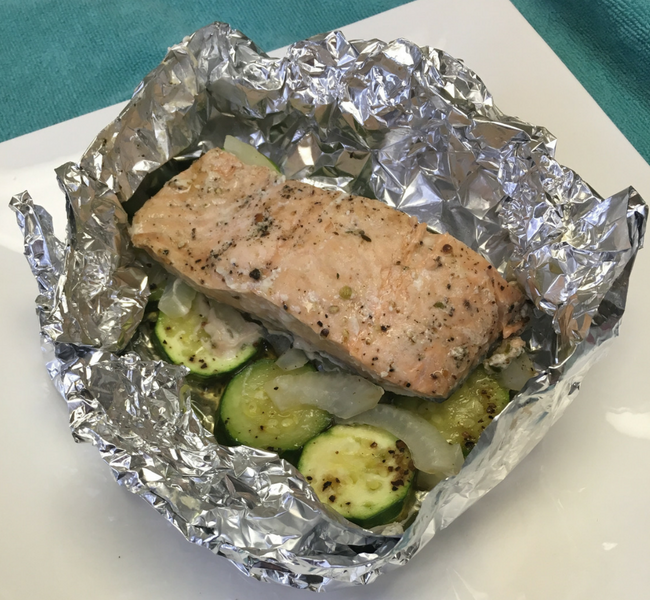 Fold each piece of foil in half and put in a layer of 6 zucchini slices. Add a slice of the onion (break it up a little) and then sprinkle with salt and pepper to taste. Add a piece of salmon, the top with a slice or two of lemon and a drizzle of olive oil. Time to fold it up! Turn the foil so that the skinny end of the salmon faces you. Fold the bottom and top of the foil in, then bring the two sides over like you’re folding a letter. Give it a gentle squeeze to make sure it holds together, but you don’t need to pinch it too tightly. Lay the packs on a baking sheet and bake for 15-20 minutes (or put on the grill for about the same time). I’ve tried lots of vegetable with this recipe -- Zucchini works best. You can add mushrooms, but they won’t get delicious and browned since we’re using steam to cook the fish. Bell peppers tend to overpower the fish, as does asparagus. You can definitely experiment if you want, though! Since we didn’t pinch the foil tightly, you can gently open a pack to check for doneness. I like my salmon a little pink in the middle, but my kids like theirs well done. It’s easy to make everyone happy with this recipe, just pull the packs out as they’re done and leave them sealed until everyone is ready. I usually add a baked sweet potato or some brown rice to this meal. Salmon and zucchini is delicious, but it’s not enough to keep me full for long. Even with those additions, it’s about as healthy as you can get! Check back next month for a summer classic: burgers!